The magnificent Fuente de Neptuno (Fountain of Neptune) in the Plaza de Canovas del Castillo depicts the sea-god Neptune in a conch-shell chariot pulled by sea-horses and surrounded by dolphins and seals. A legacy of the Bourbon dynasty of monarchs, it was part of the Salón del Prado project, commissioned by Charles III to provide a spacious avenue with gardens in the Paseo del Prado as a dignified meeting place for Madrid's wealthier classes. The intention was to border the area with two fountains, Neptune and Cibeles, but ultimately a third, Apollo, was added in the centre. The project was started by José de Hermosilla under the supervision of the Count of Aranda, but on Hermosilla's death in 1775, it was taken forward by Ventura Rodriguez. Rodriguez commissioned Juan Pascual de la Mena to make the sculpture in white marble, and the work was completed in 1784. Neptune holds his familiar trident in one hand, and a coiled snake in the other. The three fountains, Cibeles, Neptuno and Apolo were intended to represent the elements earth, sea and fire respectively. Originally situated between the Prado de San Jerónimo and el Paseo de Trajineros, facing the Cibeles Fountain, the Fuente de Neptuno was moved to its current position in 1898. Ventura Rodriguez was one of the most prominent Spanish architects of the late Baroque period, and also designed the Church of San Marcos in Madrid. Amongst his most famous works are the Baroque Chapel of the Virgin in Nuestra Señora del Pilar, Zaragoza. Juan Pascual de la Mena produced figures for the Royal Palace, as well as important religious works such as the Cristo de la Buena Muerte in the Church of San Jerónimo in Madrid. He also collaborated with Francisco Gutierrez on the Cibeles fountain, part of the same project as the Neptuno. Charles III of Spain is chiefly remembered for his curtailment of the powers of the Inquisition, his quarrels with England and his programmes of infrastructural improvement in the country, such as roads and canals. One of Madrid's major universities is named after him. 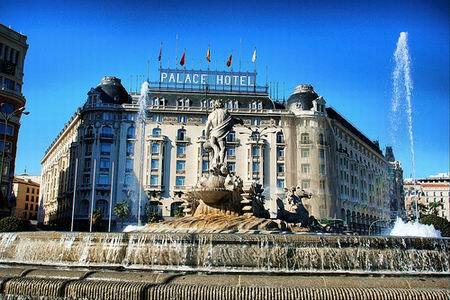 Today, the Palace and Ritz Hotels are situated close by the Fuente de Neptuno. Atletico Madrid football fans celebrate their team's victories in the fountain, but at other times it is a peaceful contrast to the busy traffic surrounding the nearby Cibeles Fountain. The nearest Metro station is Banco de España, and a short walk will take you there. It is particularly worth seeing at night, when it is spectacularly lit. It is within easy walking distance of some of central Madrid's best hotels, and close to the Prado and Thyssen-Bornemisza Museums.